When all is said and done, home-buying is a personal choice. You have to be happy with what you are buying, and I’ll do everything I can to make that happen. Website home search more popular than ever! I was looking through the home search history that people have done on my website, and noticed that today was the day of the 2,000th home search! This is truly exciting, because it was only 1 month ago that the 1,000th home search was done! Continue reading Website home search more popular than ever! Posted on February 4, 2009 February 4, 2009 Author MariyaCategories Buying, InformationTags home search, websiteLeave a comment on Website home search more popular than ever! I only want new homes! or I really want an older home with charm! When you are looking for a new home to buy, do you care how old it is? Some people do. Some people only want homes that are virtually new. Others might like the rustic charm that comes from owning a home that has been around for a century. I’ve mentioned before that the home search feature on my website is quite popular. As I talk to people who are interested in buying homes, one of the questions that I always ask is, "What can I do to make my website more useful to you?". One of the answers that I’ve heard recently is that people have wanted a way to limit their results according to how old the homes are. So, I’ve been working on an addition to my home search that lets users "pick their age" and today I’m releasing it to the public. From the search page on my website, there is now an option for ‘Age:’. 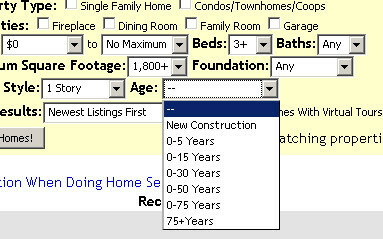 If you don’t care about the age of the homes you are looking for, just leave the option in its default position. But, if you want to restrict your search to homes that are newer, you can choose one of the options in the drop-down box. The ‘New Construction’ option is special. Realtors typically use it to refer to a house that hasn’t yet been lived in. If this is the particular type of home that you are looking for, choose that option. If you really enjoy older homes, choose the option for homes that are older than 75 years. I want to be your Realtor. Features like this are just one of the services that I provide. Are you thinking about selling your home? I have a well-visited website. Why not have your home featured here? More "eyes" on your home means that it will sell quicker, for more money. Leave me a comment if you like this feature, or if you have suggestions for other things that I should add to my site! Posted on January 17, 2009 January 21, 2009 Author MariyaCategories Buying, InformationTags home age, home searchLeave a comment on I only want new homes! or I really want an older home with charm! My Home Search is a very popular part of my website. In fact, I’ve had over a thousand searches performed in just the last couple of months. Sometimes, I have a person that might do the same search several days in a row. I don’t want you to have to take your valuable time doing this, day after day! My best suggestion is to just let me set you up using my automated system. It constantly checks for new or updated homes in the area, and will send you an email as soon as anything occurs. Some people enjoy doing the web searches themselves, though. That’s great, and I don’t mind at all! But, I want to make your life a little bit easier. No longer will you have to come to my website and select all of your criteria each time that you want to do a search. Now, my website will automatically remember the recent searches that you have done. As you can see in the picture (click it for a larger view), your recent searches are listed, and you can easily perform the same search as before by just clicking a single button. Check out my Home Search to start building your own list of recent searches. I hope that you enjoy this feature, and I often add things to make my website more useful based on your feedback. Please let me know what you think! Note: You might think that features like this only help out home buyers. But, if you are thinking about selling your home, see me! Features like this bring more home buyers to my website. Why not have your own home featured on a website that buyers like to use?